I know of this small and busy eating place in Mumbai which serves only one item- South Indian rice plate in two forms: limited and unlimited. The owner is a stiff-faced elderly gentleman who dispassionately issues tokens when you reach the cash-counter, after which there is a long wait to get a seat. Any effort at asking for a preferential entry in seating is always replied by a dispassionate “wait karna hai to karo varna paise vaapis lo.” (Wait if you need to; else please take back your cash) in an Udupi accent. When he is not shooing away requests, he is bluntly reminding people seated inside not to idle time on the seats after the meal. When I was initially subjected to this “rude” attitude years ago, I was sure that such joints will have no loyalty what so ever. With a few years gone by, I am “a loyalist” of this place and have found that this is one of the few places that seem to have a strong and growing set of “loyal” patrons. Why does this happen ? Good food, consistent service, no-nonsense pricing – I have still not found the real answer, but this small place has made me question my own understanding of “customer loyalty”. How often do we exhibit loyalty-demonstrating behaviour as customers? “I want only Mustaqbhai to cut my hair at the saloon”, “Sirf dadu's ki cutting-chai mein dum hai”, “Only Maria understands the henna requirement of my hair”, “Only Thums-up for my rum”. I have heard these and many more comments and they often make me think that loyalty is a state/goal worth chasing in our business. At my workplace, I often meet consultant gurus who want to vend customised loyalty programs. Having shifted to the retail business, I have come to realize (maybe like the stern Uduipi restaurant owner) that the only truth about loyalty is that “there is NO such thing as loyalty”, atleast in the conventional way. Let's try to debate five “traps” of the conventional understanding of loyalty . These “traps” are also experienced in the many existing loyalty programs. More often, these “traps” are shaped in form of “rules” that turn into major pitfalls. Guess what! I pawned my gold ornaments and shopped all day; I have become eligible for the Gold Card. 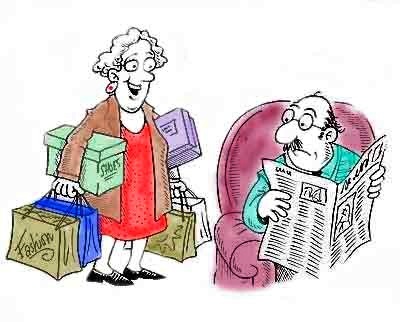 Many of us are exposed to special schemes for “loyal customers” which reward people more on 'buying more'. The scheme promises special benefits when you “spend more and become the golden-card member”. Closer at workplace I have seen teams get heady with the success of such schemes. I discovered the pitfall in this rule when a simple housewife told my team in an interaction that “I hate this because you always make me spend more than my budget. It disturbs my home budget balance.” In this case , our enthusiasm of giving her special discounts was putting loyalty in the reverse gear. Crowded cash tills in hypermarkets of India have often been a discouraging factor to many customers. This crowd is most accentuated on Saturdays and Sundays. Faced by this challenge, our retail teams would try “happy hours” for customers. Those who shopped before 2 pm on Saturdays and Sundays would be rewarded. Not only did this scheme fail to work with customers, it created potential “dissonance” among customers who would shop with their spouse and children only after 2 pm. We still battle the crowded weekends at our stores but a significant opportunity got created when the visionary promoter of our organisation suggested “why don't we create a weekend environment in the middle of the week”. This resulted in a strong “bazaar” getting created every Wednesday. Homemakers who would be busy over weekends, working couples and singletons now throng our stores on Wednesdays leaving space for many more families to shop on weekends with us. This has led to good business gains and importantly, more happy customers who come “again and again”- some on Wednesdays and others on Sundays. Would you have called this as a “loyalty-creation” thought? Conventionally-No. In your last visit to the cosmetic counters at the departmental store, have you been hounded by the smart and aggressive counter sales persons. They readily dish-out fragrance Brands A and B and provide lip-liner demos for Brands C and D. It appears that they are perennially in the rat-race to edge out all brands other than theirs. The aggression and exclusive sales-pitch often ends up appealing only to the people who have come prepared to buy cosmetics be it brand A or brand B. All these sales boys and girls believe that customers come specifically to buy their brands. That's true, but what's often overlooked by all of them is that such customers are a minority comprising not more than 5%. The majority 95% are non-users who could be seeking some 'beauty' product, some starting advice. But this need is overlooked by the 'Buy ONLY me' attitude of the three brands. If all three brands had made an inclusive sales-pitch 'a cosmetic' first (and a Brand later), to this customer group, many more customers would have tried beauty products. The mantra therefore could be “inclusive growth”. At first this may appear to diminish loyalty but it is strongly felt that people who follow this mantra will eventually have a larger share-of-mind. Most of the loyalty schemes “keep scores”. They keep building an artificial sense of comfort that some value is being continuously piled up by our “loyal” purchases or patronage. Often there is an artificial scarcity being created of lapsing unused points, missing freebies if we don't act early, "never before discounts for loyal customer”, the list can go on. However this contrasts most of the loyal relationships we enjoy in the real world. Imagine a mother keeping scores for all the nights she stayed up for her kid; friends keeping a tally of all the times they kept company in bad times; a teacher keeping a tally of the good grades he earned for the top-ranking student. If there is no score-keeping in the real world, why should any customer relationship have a tally. Scores “compare”, scores add the mortality into relationships. The obvious downside of a tally-system is that the moment another score-keeper enters the fray with more efficiency and efficacy, the customer switch is imminent. I believe its time to move beyond a score-keeping mechanism in any relationship that recognises and compliments loyalty. Make the consumer devise the rules of engagement, break all conditions, compliment the customer irrespective of the “buy” frequency remaining low/high, have an inclusive relationship and make score-keeping redundant. I would therefore strongly advocate building an intimate understanding of the customers' life-cycle and mirror this in every engagement, in every solution offered to the consumer. I am reminded of a bindery machine producer, headquartered in Kerala, who advocated cost-efficient manual tips of handling paper wastage to one of his small customers. After many years, when the customer bagged a sizeable order, the machine manufacturer coached the customer on automation and assessing demand through forecasting model. In this case, the relationship had blossomed into a close understanding of the evolution of the customer and this relationship is likely to stand all tests of time. Sadashiv Nayak is one of the most sought after name in food retailng in India today. Mr Nayak has brought in an innovative approach to food & grocery retailing and is recognized for his role in the rapid expansion of Big Bazaar.